Cool temperatures call for boots that look as cozy as they feel! 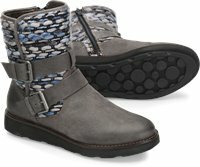 These fashionable leather boots are crafted with sweater-inspired accents for soft-to-the-touch charm – and they’re finished with a slip-resistant rubber sole. Inside, our footbed offers firm yet flexible support. I love these boots! They fit really well, are really lightweight but comfortable and seem really well made and durable. They are so cozy and I love the pops of color on them. I live in Seattle which is frequently wet and they keep my feet nice and dry. I highly recommend them. They did involve a tinsy bit of breaking in - about three or four full day wears, but now they fit perfectly.